The Tokyo Disney Resort Blog just posted new concept art and info for the updated Fantasyland at TDL and a new Frozen-themed port/land for TDS. This time, in this development initiative, the "re-development of the fantasy land" of Tokyo Disneyland composed of a plurality of areas, some of the Disney movie "Beauty and the Beast", direction on the theme of "Alice in Wonderland" It has decided. In addition, "the development of new theme port" of the Tokyo Disney Sea, a part of the area was the world of the Disney movie "Anna and The Snow Queen" and the theme, and direction to the whole theme of the new theme port and the "Nordic" It has decided. 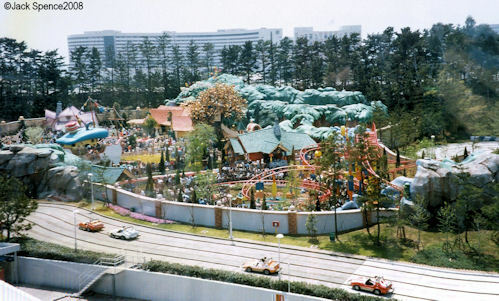 Any of the area also introduced such as Tokyo Disney Resort original attractions and restaurants, and our policy is to develop as a new area full of here only attractive in the world. New theme port on the theme of Tokyo Disney Sea "Nordic"
Just saw it! Is the Nordic castle thing similar to the Frozen ride at Epcot? I guess it is! Thrilled to see that it's all official. Looks like the speculation around here was pretty spot-on. The art work looks lovely, especially the Beauty and the Beast sketch. Last edited by DisneySeaFan; 04-28-2015, 12:59 AM. I believe the E-ticket attraction will be housed in the mountain. The castle will probably be housing a restaurant or some kind of M&G. The attraction will be on a FAR grander scale than the Maelstrom retheme at Epcot (which is probably D-ticket at best). That has a budget around $80 million whereas this (according to insiders) is costing on the order of $400 million and more. It will also be a modern (and most likely trackless) dark ride compared to the dated boat ride version at Epcot. When I was at TDS a few weeks ago(Thur. 9/4) I saw a female Japanese manager escorting two Caucasian men around. I saw them stand at the portion overlooking the empty area behind Stormrider and adjacent to Indy. One of the men was an older looking man and the other was Asian. The Asian man was wearing a "Walt Disney Imagineering" jacket. It was CLEARLY obvious what they were doing! It felt like looking into a little moment in history. The English announcement is here by the way. Thanks for the info. It sounds so amazing! The Beast castle looks bigger as well compared to MK. When I first saw the concept of new TDS port, I thought it was Mystic Manor... How silly i am! Last edited by Duyanh92; 04-28-2015, 02:58 AM. Thoroughly jealous here in California that they get all this cool stuff haha. I have to admit, I scrolled down as "hmm" "okay" and "woah!" Nordic Port (is that the actual name?) looks amazing. The press release mentions Scandinavia. In following the naming pattern of the rest of the ports of call, I'm guessing the most likely name is Scandinavian Fjord. Have you noticed two interesting things? Dumbo is being moved right in front of the entrance to Toontown. The Queen of Hearts Banquet Hall (in the new artwork) is set back in the new area--you can clearly see the entrance to the restaurant is well behind lots of new foliage and stuff. And despite it being clearly visible in the original concept art, it's very odd that no mention was made of the Seven Dwarfs Mine Train being part of the expansion. That will be a katakana nightmare. スキャンだネービアンフィヨード (sukyandaaneebian fiyoudo). I'm already laughing at the potential abbreviations. Scandinavian Fjord would be in-line with these names. First adjective would designate the location in Northern Europe, while the latter describes a narrow body of water with mountainous terrain along its side. Oh yes I miss understood that. Thanks for explanation. Now this sounds great haha! There was never a SDMT in the artwork. It became a lot more clear with a slightly higher res version of the artwork that what people initially thought was SDMT, was just the existing Toontown mountain range. If you zoom in you can clearly read toontown still scrawled on the mountain. What's incredibly interesting about this is the somewhat significant amount that they are pushing beyond the berm. Not only that, but there is clearly a lot of extra delineated room that could be used for a small Tomorrowland addition behind Space mountain. It actually connects pretty nicely with Star Tours, I wouldn't be surprised if there are some medium terms plans for a star wars presence. You're looking in the wrong place! I know Toontown and Pooh's shop from the Mine Train. Where are you seeing it in that artwork?